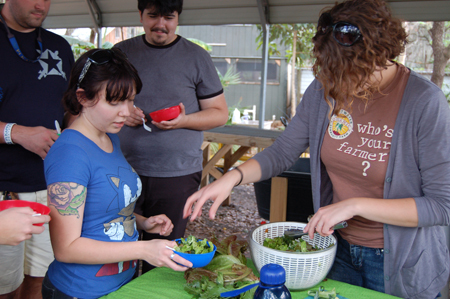 TAMPA, Fla. -- What do elephants, giraffes and zebras have in common with a great tasting salad? 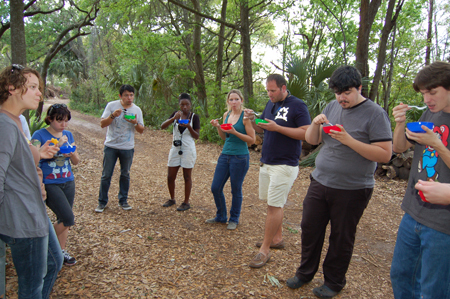 Just ask the students of University of South Florida’s Religion and Food course. 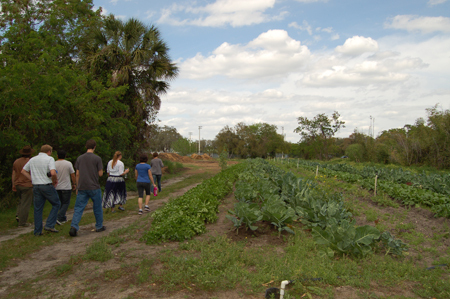 The class, taught by William Schanbacher, Ph.D., took a field trip on March 7, to Sweetwater Organic Farms in Hillsborough County. During the tour, students learned about the growing processes and techniques that deem Sweetwater’s produce worthy of being called organic, which according to Zachery Allen, one of Sweetwater’s farmers, is why their produce is so delicious. Although Schanbacher’s course investigates the intersection between religion and food on global, domestic and local levels, the emphasis is on how food serves as a locus for engaging social justice movements during the production, distribution and consumption stages. Schanbacher wanted to show his students that they have alternatives and choices when it comes to the foods they consume. 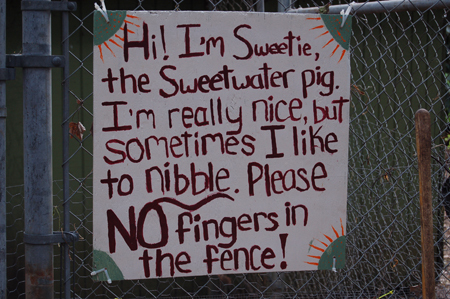 “Sweetwater itself has volunteer opportunities that are beneficial for both the volunteer and the farm. Volunteers help with the farm work, but in the process, they gain insight and knowledge that may help them grow their own food,” Schanbacher said. 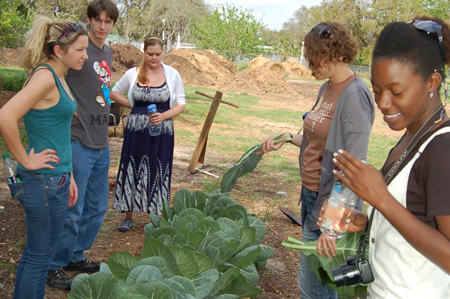 Throughout the tour, the students learned hands-on how to plant, nurture and harvest various types of vegetables. Each student received their own mustard green seed, some organic compost and a paper planter that could be planted directly in the ground. Then they explored the greenhouses where the seedlings are nurtured to a healthy planting stage and eventually planted in one of several growing fields. 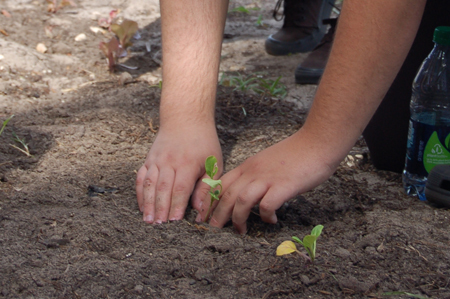 At one of the largest such fields, call across the creek, students learned about the transplanting process and eventually the harvesting. According to Sweetwater team member Virginia Vogt, organic plants must be grown, packaged and stored without the use of synthetic fertilizers, pesticides, herbicides or irradiation; otherwise, they are not organic. 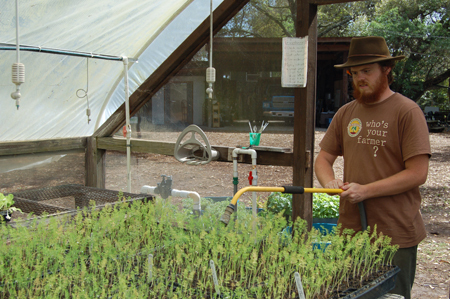 Vogt insists, however, that quality produce begins with quality compost, and that’s where Lowry Park’s exotic wildlife comes in. 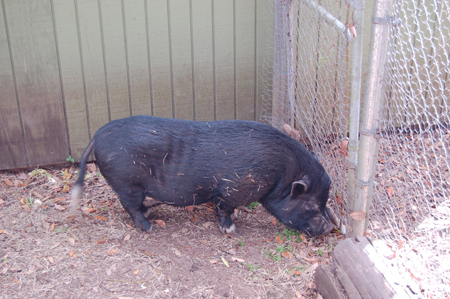 Sweetwater has a contract with the Zoo that allows them to attain the animal’s waste for composting. Evidently, nature did its job quite well. At the end of the day, students were treated to a salad that included vegetables that were hand-picked just minutes earlier. According to Blaze Buck, a USF senior, it was not your typical store-bought salad. 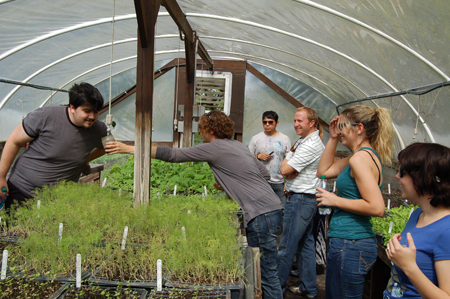 Schanbacher hoped that his students would gain insight into the world of organic food as well as opportunities to get involved with it at the local level. 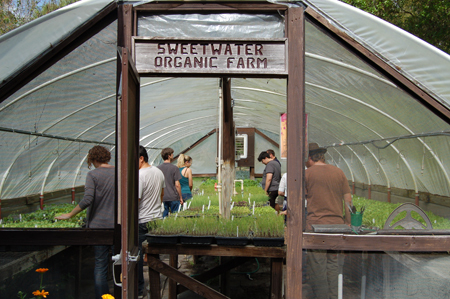 Sweetwater Farms offers tours (for a minimum of 10 guests) November through May, their growing season. 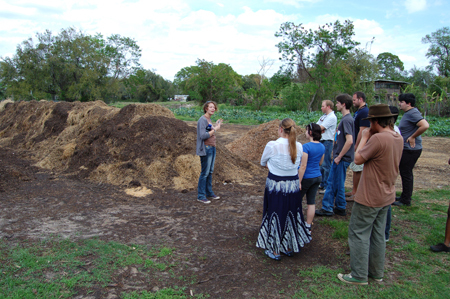 Their tours give people a chance to explore ecological interconnections, practice appropriate land stewardship, and master sustainable agriculture techniques, all in a local setting. 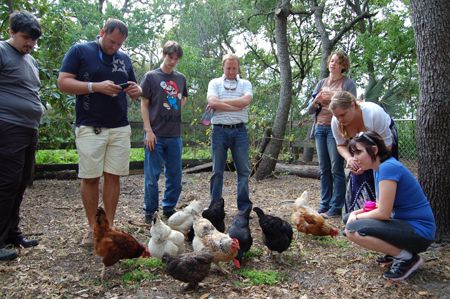 The farm was established in 1995 as a nonprofit community-supported urban organic farm and environmental education center. They are located at 6942 W. Commanche Ave., Tampa, Fla., and their phone number is (813) 887-4066.